I am an architect and urban designer in New York City; co-author with Robert A.M. Stern and Gregory Gilmartin of New York 1900, Metropolitan Architecture and Urbanism 1890-1915; and Chair of CNU NYC, the local chapter of the Congress for New Urbanism. Our 3,000 members nationwide include urban designers, architects, engineers, developers, elected officials, and plain old citizens. CNU NYC opposes any procedural changes that decrease public input and process. In his first month in office, Mayor de Blasio came out of a meeting with the Real Estate Board of New York and famously told the press that New York will build as high as it has to to provide affordable housing for the city. In retrospect, it is clear that this policy is making the cost of living in New York City more expensive rather than less. Mayor de Blasio, whom I voted for, tied the planning policy of the city to the wishes of the richest and most powerful special interest group in the state, and the city has suffered. REBNY is outspoken in their belief that New York has too many historic landmarks and districts. Parasitically, they want to use the value created by historic neighborhoods to add to the value of their buildings at the same time that they erode the quality of life by adding gleaming towers to traditionally-scaled neighborhoods with masonry buildings. This goes against the historic mission of the Landmarks Preservation Commission. We all know the role the destruction of Pennsylvania Station in 1963 played in the creation of the LPC in 1965. But Mayor Giuliani’s Planning Commissioner, Joe Rose, tells us that New York City’s 1961 Zoning Resolution was equally instrumental in the creation of Historic Districts and the LPC. Rose called the Zoning Resolution an ideological statement of Modernism. When New Yorkers saw the building it produced, they wanted to save whole neighborhoods as much as individual buildings, because the development of the time was destroying the character of the neighborhoods and the city they loved. Three-and-a-half months before the Landmarks Preservation Commission began, the residents of Brooklyn Heights successfully concluded their fight to make their neighborhood the first Historic District in the city. Other neighborhoods quickly applied to become historic districts. New York now has 141 historic districts. Every one of them is an implicit statement that the residents prefer what they have to what the Real Estate Board of New York and the New York City Planning Commission want to give them. Current city policy is giving enormous short-term profits for many developers, at great long-term cost to the city. Historic preservation preserves neighborhoods where people want to live and work. Public interest created the Landmark Preservation Commission. 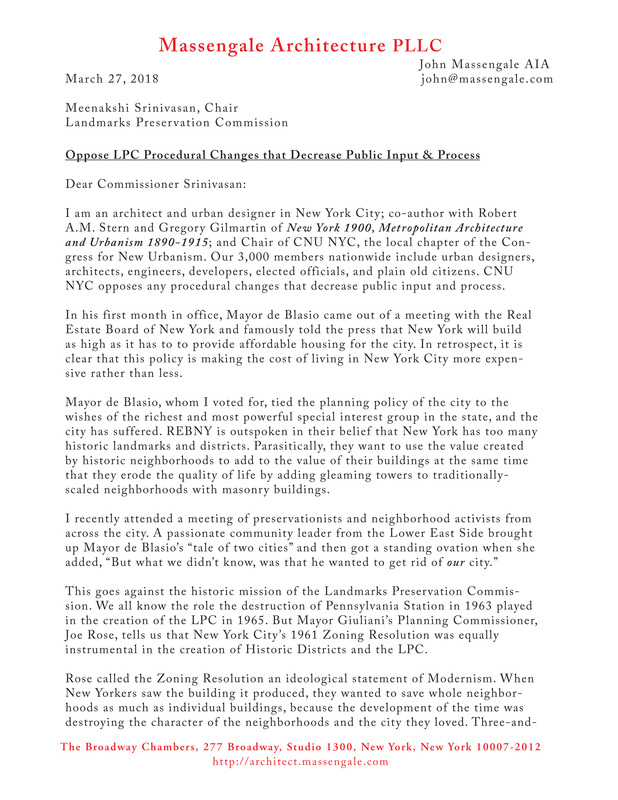 CNU NYC hopes that New York City will respect the history of the LPC itself as a watchdog for the public against private interests that harm the common good.